Driving and music are inherently linked together. Music is synonymous with the zest we feel cruising down the highway – so much so, that driving without music often feels as though there’s something missing from the equation. This often makes the stereo one of the first features we investigate when we are thinking about purchasing a vehicle. You can have the best musical taste in the world, but if you don’t have the speaker quality of power to back up your tunes, there will feel like something equally important is missing; we all want to feel the bass in our seats, and hear the silky smoothness of our favourite singers’ voice. The right speaker is the only way to get you the sound quality you want. In this post, we’ll look at what car speakers work best for specific models and types of vehicles. We’ll discuss how to determine what speakers will give you the best sound, and some basic speaker tech background. Aftermarket car speakers usually come in one of two system types – full-range and component speakers. Each have their advantages and disadvantages, but you can make the best choice for your car once you know what each entails. Full-range speakers are the jack-of-all-trades in the speaker world. In the simplest definition, full-range speakers include a woofer for low thumping bass, and centrally mounted tweeters to produce highs. Some models and companies will factor in midrange drivers, or super-tweeters to get a fuller sound. Most individuals looking to replace their factory speakers choose full-range speakers because they offer good quality, and the process is fairly straightforward and simple. Component speakers on the other hand, offer superior design to offer the best sound quality available – but these systems require separate woofers, tweeters, and external crossovers that combine to create a full, rich sound. Tweeters and woofers are mounted strategically in the vehicle to provide the best audio imaging and more realistic sound. They’re typically built from better materials, but cost more. Stock speakers are often constructed of subpar materials that produce acceptable sound for minimal costs, whereas aftermarket speakers are often constructed of lighter, stronger, and tighter materials that produce exceptional sound. Woven fabrics, carbon, and synthetics coated in metals like aluminum or titanium are often used in woofers, whereas high quality tweeters are typically constructed from soft materials like textiles, silks and synthetics, giving you smooth and refined sound. Surrounds, that surrounds the woofer cone must allow the speaker to freely move. They’ve also got to be tough and durable enough to withstand loud volumes and movement as a result of their function. Surrounds constructed of rubber are always of the best quality. Before you go out and spend a bunch of hard-earned cash on a new set of great new speakers, there’s also an issue of power delivery, handling, and sensitivity. You should always know beforehand the power and types of speakers that your vehicle already has. 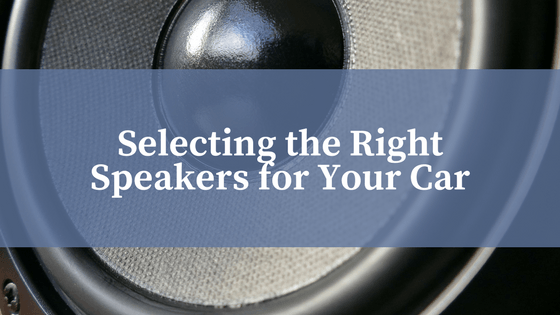 Most people will opt to simply replace the stock speakers, meaning that measuring and selecting your desired speaker type will be a straightforward choice. In most cases, this is a simple process that means dropping new speakers in place of the old ones. However, if you’re thinking of ramping up power, or converting to a component system, you may need to address your speakers being able to handle the power delivered from your head unit, or possibly add an external amplifier. Handling refers to the level of power that your speakers can handle, recorded in watts. It’s important to match these stats before buying a new head unit to make sure that your speaker choices can handle the power of your new stereo. Sensitivity refers to how much power the speakers require at a minimum to produce a given volume level. Speakers with higher sensitivity require less power, while speakers with low sensitivity work very well with high-powered external amps. Keep in mind, that you get what you pay for; a speaker worth a few bucks will inevitably pale in comparison to a speaker system that costs and arm and a leg – but everything is relative. You can have the most expensive speakers in the world, but if they’re not carefully installed and situated in the vehicle, you could lose out on all the great sound you think you’ve paid for. Sound travels both frontwards, and backwards, meaning that sound-deadening or dampening material is a crucial aspect of the installation process. Dampening material comes in large sheets that are cut to fit the shape and size of your specific system and helps reduce vibration, resonance, door rattling and additional audio faux-pas’. Location is also important. Replacing your existing stereo means that you’ll be taking advantage of a system that’s been optimized to give satisfactory sound, but careful digital configuration will help you to distribute your sound evenly throughout the car – or direct a bit more power to the larger speakers that can handle more grunt. Whatever your reasons for replacing your vehicle speakers and stereo, you’re investing in a system that’s sure to get a lot of use over the time you own your vehicle. Better sound is never a poor purchasing decision, and you don’t have to be an audiophile to appreciate the added quality of sound to your favourite tune as you cruise down the road. Don’t forget, some do-it-yourself installations can void certain warranties. It is important to check in with your certified dealership to ensure you are getting the best experience possible while maintaining your vehicle’s current condition.